The Brother PT-H500LI Handheld Label Printer is a handheld label maker that can run on either battery (included rechargeable Li-ion or optional AA) or AC power and can connect to a computer for increased functionality. The PT-H500LI has a printer resolution of 180 dpi, providing a good resolution for text printing. It works with the TZe tape family and can hold a max tape size of 0.94" x 26.2'. The printer features thermal printing technology so that you do not have to worry about ink levels while printing. There is even an automatic cutter for producing labels with the precise length needed for the job. This allows the PT-H500LI to print at speeds of up to 1.2" per second with AC power or 0.8" per second with the rechargeable Li-ion battery. Additionally, you check what you print with the 16-character by 3-line backlit LCD display and utilize the built-in QWERTY keyboard. For additional features and capabilities, this printer can be plugged into a computer with a USB cable. You can then use the included P-touch Editor software for Mac or Windows to design more elaborate and exact labels. 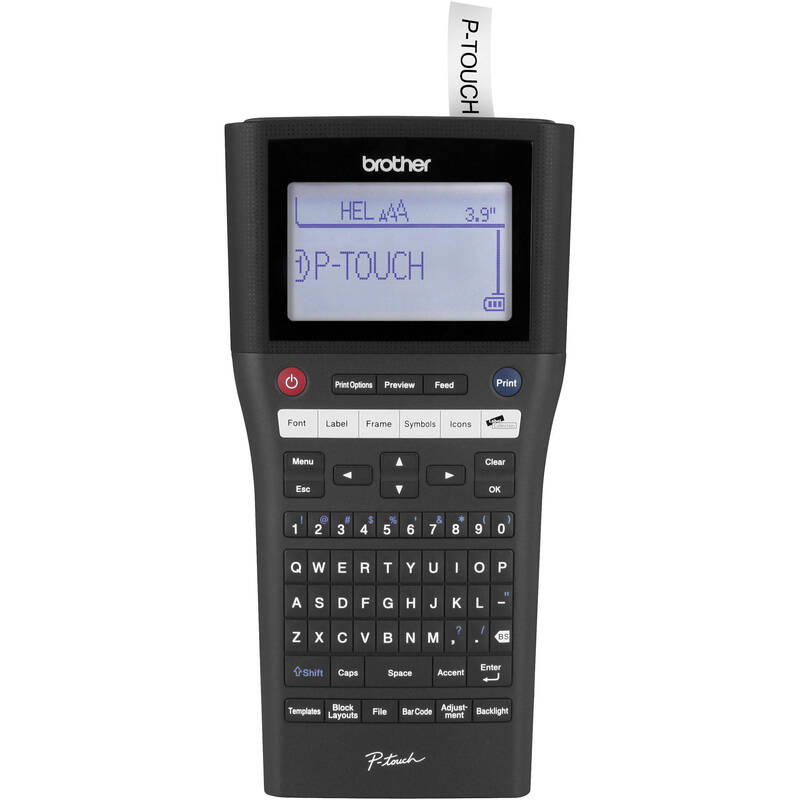 The PT-H500LI includes the AC adapter, battery, USB cable, CD-ROM, and a Black on White Standard Laminated TZe Starter Tape that measures 0.94" x 13.1'. Maximum print height of 0.7"
Box Dimensions (LxWxH) 12.1 x 12.0 x 5.0"
PT-H500LI Handheld Label Printer is rated 3.8 out of 5 by 4. Rated 4 out of 5 by newtobrother from Great Product-Questionable Support I received my H500 li on 04-03-15, read the quick start guide and charged the battery. From the first time I turned it on I noticed that the LCD had a blank area across the top. This area (approx. .10 in wide) left most of the screens with letters missing the top section. It took 3 calls to tech support to talk to a person, I reset the unit as instructed, the display remained unchanged. I was told that my problem was going to be given to the next level of support and I would be contacted in 2 to 4 hours. Ten days and I have had no response. The printer works fine otherwise, and I am pleased with the quality of the labels and ease of the editing software, although it would be useful to be able to save items to the unit for use in the field. Rated 5 out of 5 by Dragonbird from Great quality and easy to use. First impressions, it appears well made. Feels solid when you hold it, not like a cheap toy. Buttons are well marked and easy to read even for my old eyes. The display is backlit and also very easy to read. I like the fact that you can use the supplied rechargeable battery pack or your own batteries. We needed a printer that would work for regular labeling and for labeling wires, this does both very well. Printing is very crisp even at the smaller font size. The tape cartridges are easy to change and come in various sizes of tape and colors! The software installed on my machine with no problems, it even did an update right away. The wizard is very nicely done, many examples to choose from. You can even press a button to take a website to purchase supplies. I would suggest that once you have installed the software, use it! There are 3 modes, Express, Professional, and Snap. You can do a lot of things with this labeler that you can't with others. Rated 5 out of 5 by volover from Easy to use This is the first time I have used a device like this. The price appears to be reasonable with all of the features. The instructions are very understandable with no problems. I like the rechargeable "Take-It-Anywhere" option as the work can be done in the field etc.